I am an interdisciplinary artist. My work is about collective memory and the synchronicity of time periods. I recognize past, present and future happening simultaneously. I use photography, video, sculpture, and sound to deconstruct accepted realities in order to recreate new conceptual mythologies. By layering methods of science fiction, collage theory, and folklore I reconstruct stories, examining themes of gender, class, race and time. My work has led me throughout the world; collecting stories, researching cultures, participating in myth and ceremony. I collaborate with artists, communities, students, landscapes and history. I am interested in the human experience. I work to tear down boundaries of forgetfulness. To encourage us to remember one beginning and one end. I examine the connections between these two points. The connections I discover inspire an infusion of both cross-cultural phenomena and popular culture, new fables and new science fictions. Within those discoveries I create other realities, magnifying the lens to look closely at the intentions of realities. This process is present in all my work. Totems, tarot, bottle trees, mantras, religious texts, mysticism, popular culture, cultural shame, urban legends, childhood memorabilia, funeral rites, folk music (from chanting to hiphop), creation stories and symbols are all my tools to expand on, to alter, to make timeless. 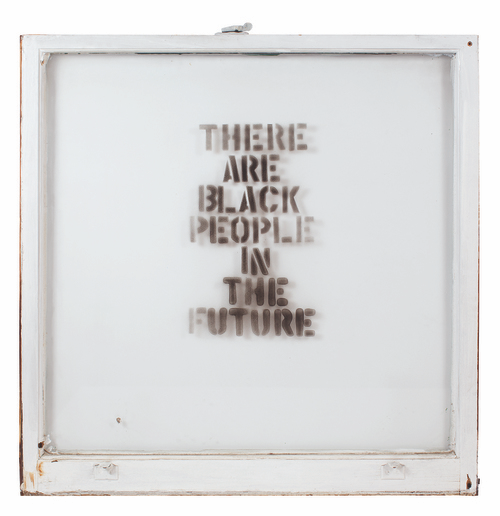 From the series, There Are Black People In The Future, © Alisha B. Wormsley, used with permission of the artist.